The reading selections in the next several chapters of the present volume are from Alexander Freeman’s 1878 English translation of Fourier’s 1822 Théorie Analytique de la Chaleur. 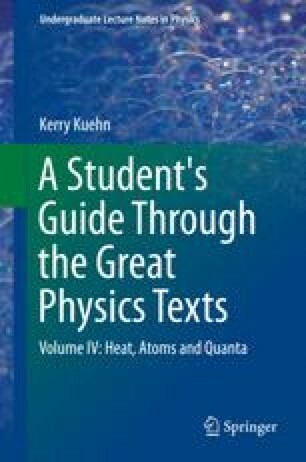 This treatise expanded on the famous paper of 1807 in which Fourier employed Newton’s law of cooling to advance a mathematically precise theory of heat diffusion through bodies of various shapes, sizes and compositions. Fourier’s 1807 paper also introduced a controversial mathematical technique—now known as a Fourier series—which allowed him to express the temperature distribution within a solid body as a weighted sum of trigonometric functions (such as sines and cosines) having different spatial frequencies of oscillation. Today, this method of analysis underlies much of electrical engineering, image processing and spectroscopy (to name just three); it also provides a means for understand the Heisenberg uncertainty principal, the basis of modern quantum theory. Fourier begins his 1822 Analytical Theory of Heat by situating his scientific work on heat diffusion into the broader framework of natural philosophy.